The fact that you didn't get one in 3 phone calls to Sony tells me that you still fail at persuasion. Plus the fact you had to put in so much effort and are still only getting a repair. Do you know how they repair it? I do. They stick the motherboard and it's components in a quote "special oven" that melts the solder and reconnects the components. Watchdog did a review on these "repaired" PS3's and 9/12 of them were broken within 6 months. Jake, you realise that those refurbs you get are only repairs. Plus, Im not getting it done through sony, GAME themselves are repairing it. And finally, i have already been told by a sony representative that it is unrepairable. At the end of the day, if they do manage to repair it, then i get my data back, which i can back up in preparation for the next time it is 'guaranteed' to break. and when it does, i demand a new one. Im in a much better position than you, with your 3rd ps3. 2 of which have been refurbs and then broken am i right? Anyway, i thought you were going to shipston at 2pm? So of your in shipston with friends then why are you on here and facebook? Go pound the vaje that your visiting. You've told mr she is hot numerou times before. Noob. My PS3 got dropped off this morning. Yes, my PS3 with all my save data, etc. Got a new warranty on it as well, so if anything goes wrong im all good. lucky, i handed mine in yesterday and they said they would give me a call either 2day or 2mrw about it. I take it the game which was stuck inside is ok right? how long did it take for game to fix it? also i thought it was unfixable? Yeah the game will be fine. btw my ping is better than urs sik, ur more of a connection player than me!!! You're with AOL though right Dan? Gaming traffic has the lowest priority. So if you could test your PING whilst playing COD it would be much higher. TVM= Tele Vision malta. Its the local TV station What does it mean there? TVM Visuals. It's just a local repair shop. Bot sure what the lettering stands for. WOAH. aint my fault ur called a connection player on cg. 1bomb every1 take 3 2 die. connection rider tisk tisk. 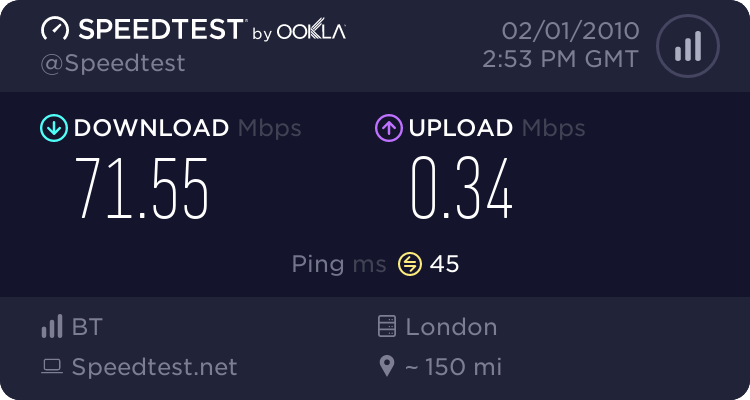 no1 else has dun the speed test thingy. Finally some1 speaks the truth!